The Bronze Bomber is still striving for respect in this country. Personally I don’t know why. Deontay is a Bronze Medalist in the 2008 Olympics. Fans have to understand that he was the third best in the world in as a heavyweight with just a 30-5 record. What he achieved in that short period of time is nothing but amazing. The last Bronze Medalist Heavyweight this country has had was Nate Jones in 1996 and the last Olympic Gold Medalist was former world heavyweight champion Ray Mercer in 1988. So the fans to minimize Deontay’s career accomplishments is an injustice. Yes he is raw, and throughout the ranks he received more on the job training in the ring as a professional. With the tutelage of former world champion Mark Breland he has done an excellent job in developing and trying to guide him into a polish fighter. His team from the beginning has placed him in the ring with guys with similar records or the same amount of experience as him. Seven years after turning pro he wins the WBC Heavyweight Title and successfully has defended that title six times. He’s exciting to watch because he is truly vulnerable to be hit but at the same time he has devastating knockout power. He’s very charismatic, bombastic, fan-friendly, and when he does have you hurt he wild in trying to finish his opponent off. But that is what makes him exciting, so why is there so much disdain towards him. 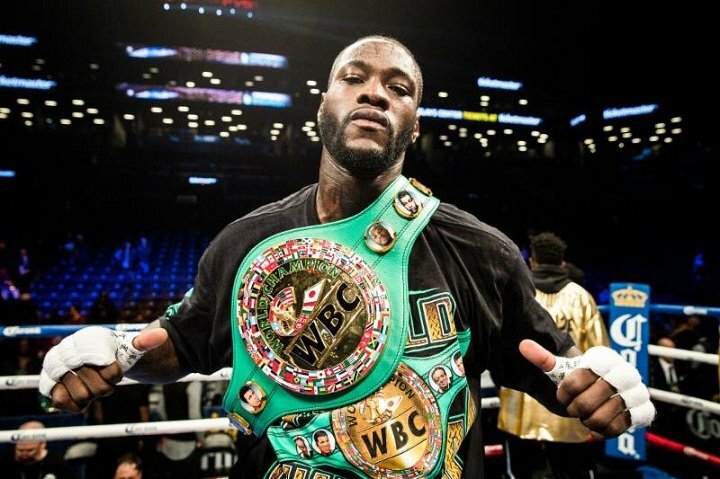 He looks to try to fight the best but it appears that the two top heavyweights at that time Povetkin and Ortiz had issues with their VADA anti-doping test results so those fights were cancelled, but a lot of fans are blaming Deontay Wilder for this. He moves on and fights the next person in line and on social media he is being labeled the Bumsquad. Which it’s not fair to him because he is fighting the best available that’s out there. He possess a 39-0-38KO record with a 97.4% knockout ratio and he has KO/TKO every opponent he has faced and still no respect. With Luis Ortiz and Anthony Joshua on the horizon maybe sooner than later Deontay will get the respect from the majority of fans in America and turn those jeers into cheers. Keith is the reigning WBC and WBA Welterweight Champion and this year he is getting so much flack about not knocking anybody out in a long time. Why doesn’t he fight this person or that person. Now the latest thing now on Keith “One Time” Thurman is that he is supposedly ducking Errol Spence. As of late if you listen to him on how he responds to questions about Errol Spence it could be interpret that he is ducking or it sounds like he’s posturing. There are two reasons where this fight may not happen until the end of 2018 or the beginning of 2019. First off Thurman is just coming off recovery from elbow surgery, so to put him backing there with the sharks in the welterweight division is not smart. If I was his manager I would set him up with a credible and durable opponent that would challenge him and knock the rust off. Second, you have to understand that Keith Thurman is the unified WBC and WBA Welterweight Champion and it’s a strong possibility that he will have his mandatory he has to face or be stripped of the titles. I hear fans say that he should just drop those belts and just face the best. That is ridiculous. These boxers fight their whole life to get to that championship belt. You are not even considered great or even get the chance to be consider to go into the International Boxing Hall of Fame without winning, defending, and reigning as a champion. Those championship belts adds value and leverage when it comes to negotiating these super fights. Some fans do not understand that and they want to boo him when he is on the big screen at the arenas or heckle him about supposedly ducking Errol Spence (This only happens outside of Florida, the state of Florida and Keith Thurman true fans holds him down) This fight will happen, during these two warriors prime years. It’s just fans are going to have to wait just a little bit longer for this super fight. For the record I am a big fan of all three of these combatants and I wish them nothing but great success. This list was very difficult to narrow down to just three. I have listen and talk to boxing fans in person at events and through social media and this is what I came up with. I would like to hear your opinions on this or is there somebody out there you feel this year has receive so much hate or grief from fans, please comment. I’m going to let you the fans determine who the “Rodney Dangerfield” award should go to.